Who are car checkers of America? 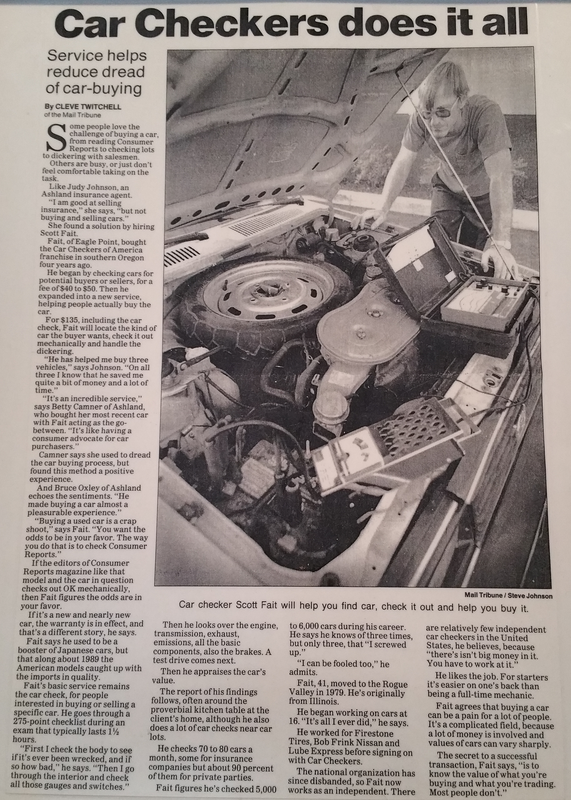 ﻿﻿﻿"Mr. Fait is currently the owner and resident appraiser of Car Checkers of America. He is an active automobile hobbyist. His involvement in the world of automobiles started as a youth working on cars since 1968. He has personally restored a 1964½ Ford Mustang and a 1963 Comet Convertible. He has previously owned several muscle cars, including a 1968 Dodge Charger, 1969 Oldsmobile 442, 1972 MG V-8, and a 1970 Dodge Challenger. He has attended Triton College in his home state of Illinois and achieved the title of Master Mechanic from the National Association for Automotive Service Excellence. Mr. Fait is also certified by the State of Oregon as a Vehicle Appraiser. Mr. Fait performs vehicle inspections not only for a number of individuals, but attorneys, banks, executors and numerous insurance carriers. He has also served as an expert witness in Oregon. Mr. Fait attends many automobile shows and auctions annually and is involved in the continuing study of automobiles. His specialty area is American muscle cars." Used vehicles they are thinking about buying or selling. Classic vehicle appraisals for insurance purposes. Complete diagnostics on vehicles going out of warranty. Assessing the value of a vehicle going off lease. Complete unbiased diagnostic inspection for potential vehicle repairs. ﻿Checkers of America is located in Medford Oregon has been in business for 27 years and a total of 47 years in the car business. They have been serving Southern Oregon since August 1989. ﻿﻿﻿﻿Scott Fait is the owner and operator of Car Checkers of America. Scott has his Oregon Car Dealer license. He is a registered appraiser and was a ASE certified technician for 30 years.